This cleat shoe has a nice black leather top with breathable rubber mesh on the front shoe and 6 strong metal cleats for gripping the ballfield. Some players are so impressed by the design and look of these Under Armour softball shoes that they affectionately call them "sick shoes." One user's testimony states "I started wearing and buying Under Armour stuff about five years ago, and really like them better. Under Armour is also smaller and more honest and less corporate. And cheaper too." These shoes are built with the standard brand innovations ArmourBound, and MicroG. They are available for purchase online and in your local shoes stores in blue or red and found in sizes 6.5 to 16. Ladies will be a lot more comfortable on the softball field wearing Women's Glyde IV ST metal softball cleats. Sporting synthetic leather and mesh designed for a lighter feel, the footwear also protects the foot from cleat pressure while providing solid support throughout the game. Many women who have tried these shoes claim that they make them feel 'smooth' on the field. An athlete should feel confident during their sport performance. These shoes can help a women feel certain of her footing through the bottom of the ninth inning. Ultra light in weight, these Under Armour softball shoes weigh under 10 oz. Available for purchase in four colors: Black and White, Silver and Black, Blue and White, Red and White; in sizes 5.5 - 12. Under Armour Men's Leadoff III Mid Molded Blue Cleats have already acquired a reputation for excellence among softball players. The comfort and support these shoes give to the foot is widely reported as the best in the brand's line. The performance EVA molded sockliner offers lightweight cushioning and comfort, allowing for extra performance without any discomfort. Rubber molded cleats with rotational traction configuration provide optimal rotational capability. These Under Armour softball shoes for men are available to purchase in diamond blue/white and sizes 6.5 to 15. 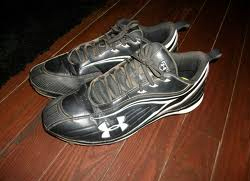 Under Armour shoes can be found at your local department stores, shoes stores, and through online websites.